The Campbell Hausfeld 2,750 PSI, gas-powered, commercial pressure washer (PW2770) delivers big performance with its Honda GCV160 engine, premium 2.5 GPM Cat Pumps® triplex pump (4DNX25GSI), and professional-quality gun and lance. A steel, welded frame is powder coated for durability and has pneumatic tires for easy movement. 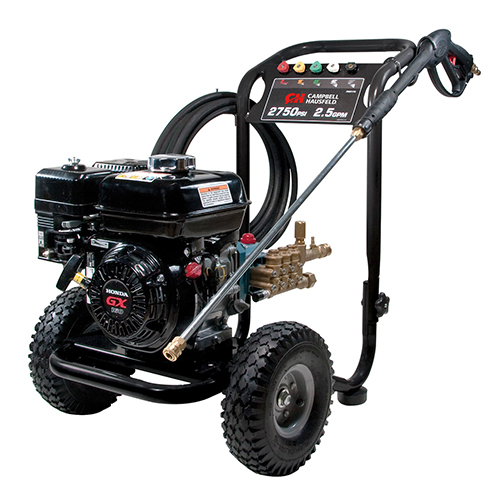 It's the perfect unit to handle tough power washing jobs at marinas and maintenance shops, on farm/ag equipment and property, and for use by contractors. Includes quick-connect spray tips, chemical/detergent tube and high-pressure hose. 2,750 max PSI, 2.5 max GPM.